Repost Camera Tip #2: Pan tilt or Ball head? Choosing a Tripod. Often times, good tripods come with the option to change the “head” (that’s the thing that attaches your camera to the legs). So the big dilemma is which type of head should you buy? The first question is should you ask is, "pan tilt or a ball head?" Many people love the idea of a ball head because it seems so “versatile” and easy to use. Unfortunately there is a serious down side to this versatility. For instance, if you have a ball head and want to just move your camera a little bit to the left on the x axis, you can’t, because your ball head moves every direction at the same time (x, y and z). This is where Pan Tilt heads are more advantageous to ball heads. If you just need to move the x axis with a pan tilt head, you can do so without worrying about the y or z axis movements. 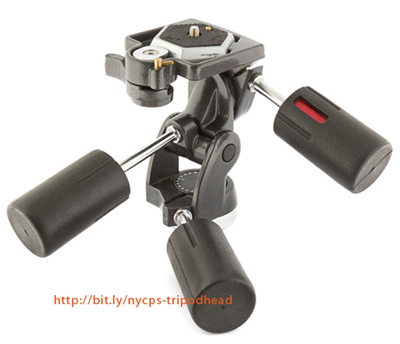 Many people will argue that the average consumer does not need to make micro changes like this, so the ball head is better; however, if you were in need of a tripod to begin with, isn’t it because you need to get control of the situation? There is one advantage of a ball head, that needs to be mentioned, often they are more compact than their pan tilt counter parts. If you are trying to reduce the weight of your camera bag, a ball head may be the answer. One thing you may want to keep in mind when buying a head is whether or not it has a quick release plate. This is extremely helpful. Also, the plate should have a bit of rubber on it, this rubber will help keep the plate snug on your camera; too often this rubber is not rubbery enough or not think enough which means that your camera will wiggle loose every time you do a vertical shot. Lastly, the quick release should be a 2 step quick release which, means that it has to have a locking mechanism that prevents you from an accidentally unlocking your camera and thereby dropping to the ground. No matter what you choose, make sure that the head & legs will actually support the weight of your equipment; you will need to look at the manufacturer’s specifications to find the answer to this. If you have too much weight on your tripod it can be disastrous. Update Nov 2015 - this post has been very popular on our site and since we posted it questions have arisen about brands. Which brand would we recommend. Over the past 5 years or so we have seen a number of manufacturers of tripod heads and legs sprout up, some from China, US and UK. Notably the ones not from China are very expensive and bill themselves as the latest and the greatest. The problem is that they do not have any track record. Although they seem fairly well built, a tripod and the head should last a lifetime, unless you are throwing off the roof of your house. Many of the reviews that we have read on line are from reviewers who have only used the product for a short period of time (less than a week or two). This is just simply not enough time to really test the gear. The other issue is that the average amateur photographer uses their tripod only a dozen times a year at the most (of course there are exceptions), which is also not a true test of the equipment. Now that some of these companies have had a few years on the ground and we have seen many of them out on Photo Safari, what we can tell you is that many of these brands are not living up to their price. We can not recommend against a brand (for obvious reasons) however what we can say is that all of our photographers either use Manfrotto (formally known as Bogen) or Gitzo. And they have had their tripods for over 10 years. Although it is true that the lower end Manfrotto does seem rather flimsy so we would recommend something over $100 just to be safe. If you are looking at making a purchase simply look at the item and ask yourself, "can I drop this 5 feet?" If the answer is yes, then buy it. Click here for information about choosing a Tripod and monopods.